Leading provider of in-room entertainment, voice-activated and secure hotel Wi-Fi guestroom technology to demonstrate newest industry trends at Los Angeles boutique hotel show. Los Angeles — February 5, 2019 — Hotel Internet Services (HIS), a full-service provider of Internet services and solutions for the hospitality industry, is set to exhibit the latest technological advances in guestroom television casting, voice activated amenity control and secure hotel Wi-Fi functionality at this year’s Stay Boutique Live Trifecta conference, taking place February 11-13, in Los Angeles, CA. Exhibiting at booth #303,HIS will showcase the latest solutions currently available to the boutique hotel industry, with live demonstrations of innovations that include advanced Wi-Fi and BeyondTV, an industry leading platform that caters to guest demands for streaming online content, hotel amenities and enhanced convenience via voice-activated guestroom control. Also making its debut at Stay Boutique is BeyondTV GuestCast™, an affordable single-purpose casting solution that allows guests to securely cast content onto guestroom televisions. 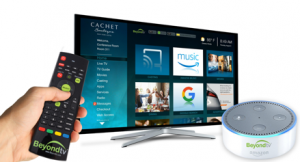 GuestCast ™ is the newest addition to BeyondTV’s line of products and services, which provides hoteliers with the ability to allow guests to wirelessly cast their personal content, including subscriptions to online streaming services, social media accounts and music. Leveraging a software integration with Volara, a leader in voice-based solutions for the hospitality industry, HIS will also demonstrate to Stay Boutique attendees how guests interacting with BeyondTV can control guestroom amenities using only their voice. When paired with Amazon’s Alexa, BeyondTV’s voice control features include the ability for guests to control virtually any television function without the need for a remote control. Other guestroom amenities that can be managed through voice control include thermostats, lighting and drapes. The cloud-based integration between Volara and BeyondTV also allows guests to use voice as a more convenient and faster method of requesting amenities, such as room service or toiletries. Guests can additionally use their voice to instantly locate specific hotel information, such as details on restaurant hours, Wi-Fi passwords, local activities or ongoing promotional offers. With HIS also showcasing BeyondTV GuestCast™ during Stay Boutique, attendees will further have the opportunity to observe a cost-effective, yet data secure casting solution that allows guests to instantly cast their own content to the guestroom TV hassle-free from personal computers, iOS or Android-based devices. Guests can also rest assured that their sensitive data is never at risk of theft or being accidentally shared, due to GuestCast’s™ device isolation capabilities that prevent cross-room communication. HIS booth representatives will additionally be demonstrating how state-of-the-art Ruckus Wireless access points provide a secure and high-speed guest internet connection and can be implemented despite budget or structural limitation concerns. Attendees will also be able to learn about the HIS Property Dashboard, a proprietary portal that provides clients with the unmatched ability to maintain direct control over every aspect of internet performance at all times. Dashboard features include the ability to view and analyze vital data, such as the number of users online, support tickets, revenue generated through Wi-Fi purchases, tiered bandwidth plans, the amount of broadband being utilized or the operational status of each segment of a property’s network; thus, maximizing the potential to consistently deliver the highest quality in hospitality Internet service and maintain complete satisfaction. For more information about the full range of technology solutions available from Hotel Internet Services, please visit booth #300 at Stay Boutique, contact Gary Patrick at 866-265-7575 Ext. 705 or email gary@hotelwifi.com.